One of my little kids is a clothes horse. He is picky, picky, picky about what he wears and has strong-as-steel opinions about what looks good and what does not. When Planet Shoes asked me to write a review of Chooze shoes for both women and kids, I thought that I would test them on my toughest critic; the above-mentioned budding fashion nut. He chose the toddler Scout in sturdy brown (right) and I chose the women's Spin in the "invent" color (left). These are not your average shoes. They are completely vegan, completely comfortable and a portion of each purchase goes to a micro-finance program designed to help impoverished women pull their families out of extreme poverty. This company is all about being bold and being different. As proof, their shoes come in different but coordinating prints for each feet. My son was immediately taken with the looks and has since become a devotee of the feel of these shoes. The kids' Scout is a slip-on that does not slip off and I love that he can easily put them on himself as we are running out the door. The print is interesting enough to please him and neutral enough to look good with most of his clothes. We absolutely love these shoes. Mine are equally fabulous. I love the slightly rounded shape of the sole... these are really easy to walk in. I wore my Spins on vacation, without socks, for a day of substantial walking and did not feel any discomfort. How many shoes can you say that about? There was no break-in period. I also find them to have a surprising amount of cushioning. These are really, really comfortable shoes. Planet Shoes is offering a pair of Chooze to a lucky Diminutive Review reader... just leave a comment on this post to enter the giveaway. The winner will be announced on Monday, June 17th! Congratulations, Sarah (comment left June 12th, 6:20 AM)!! You are the winner. Please email me at natalie@diminutivereview.com so that we can work out the details. I Love You...you know I Do! I have a pair of Chooze shoes and two of my Grands do, too! We are truly H-U-G-E fans of Chooze and would be *so~honored* to win. I would go-down as the BIGGEST fan ever!! I'd never heard of this brand......so cute! 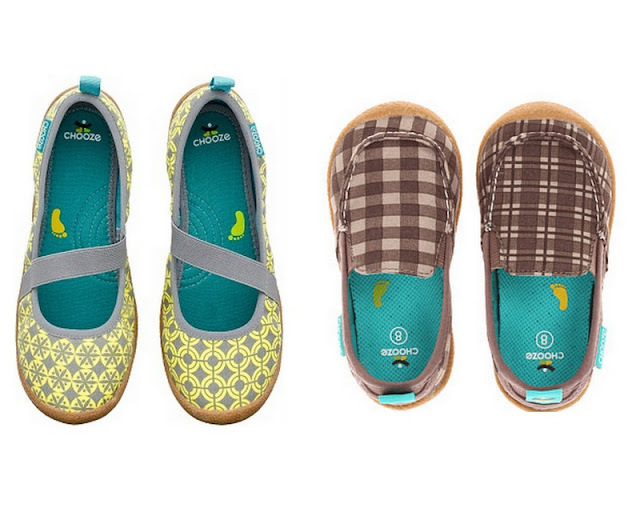 As a soon-to-be mama of two, I would love to add a pair Chooze to my toddler's collection. The prints are fabulous! P.S. Do you have any comment on how flexible the soles are for a toddler? Not sure how old your son is. Thanks! They are quite flexible... I wouldn't hesitate putting them on a toddler! ooh, i always stare at the chooze shoes in the fancy outdoor stores in our town. i would love to try them for my babies! thanks for the chance! ooooh, I would love a pair for me (twirl charm red!) and for my daughter! how to decide. they look like the perfect new summer shoes. Love both pairs. Thanks for the giveaway! I'd love to win, thanks for the chance! These shoes get wonderful reviews: here's crossing my fingers! These are adorable! Thanks for the lead and the giveaway. Both pairs are gorgeous! I would be thrilled to win! My daughter would love these! She loves mixing and matching shoes! Would love to add to my little one's shoe collection! Nothing not to love about these shoes! Oooohhhh, I would love a pair for my little one! Ooh, my son would love these! With 4 kids, someone always needs new shoes! Great giveaway! How cool! My daughter would love the mismatched shoes. Love your blog! What a great giveaway! Love the Dance (toddler) and Spin (women's) line....love the fabrice design selection, too! They sound fabulous and look great! We would love to try a pair of these at our house! Have a picky fashionista I would love to try these on! Very cute! Can't wait to check out this brand! Thanks for the giveaway! I have a stylish little guy, too! I'd love to get him these shoes! I've never heard of them before, but they are adorable! You do such an awesome job at this blog! Thanks for the giveaway. Cute shoes! I'm all for slip on shoes for my toddler! Easy on, easy off! Cute!! I want some for my kids! Thank you! Would love to try these out for either my son or my daughter. Thanks! Great giveaway! Hope you get tons of new readers because your blog is the best! Just saw them at REI for the first time and was wondering what kind of shoe it is (good/comfortable/etc.). I've been wondering about the comfort of these shoes. They are so cute! li must have been living under a rock-- i've never heard of these shoes before. my curiosity and the initial surprise over the mismatch took me to their website. I love the company's mission. now i'm digging the mismatch and the reasons behind it. these shoes, along with the tiny foot imprint printed inside, would also help my little ones wear the correct shoe on their own i would really like to try a pair especially since they don't come in half sizes and would like to test them on my little one! I love the introduction. I can't wait to pick a pair! Clever shoes. Would love to win a pair for my boys. This is the first time I'm hearing about Chooze, but a company that supports microfinance and women is great any day. Thanks for the wonderful introduction. Never heard of them before, what a great concept! What a fascinating idea. I'd love some comfy shoes! I've been looking for some good slip-ons for my son...so he won't wear rain boots all summer to avoid having to tie his sneakers! First time I've heard of them. Love the different patterns. Style and comfort? Yes, please! oh, boy. my toddler could use a pair of shoes she can use her newfound skills to put on herself. thanks for the giveaway! So cute! My little boy needs some of those... Or me. We'll have to fight it out if we win :). My earthy kids would love these! You and your blog are the only reason my kids ever have cute clothes. These shoes are adorable! I'm checking out the website now. Thanks for another great tip! I've never heard of them until now, either. I'll have to peruse their site. Both pairs are so cute! what? i love these and the ideas behind them. thanks for sharing! absolutely darling! my daughter would love a pair. your taste is so right-on! i await your new posts and get excited when i see one! Congratulations, Sarah!! You won the CHOOZE giveaway. Would you please email me at natalie@diminutivereview.com so that we can work out the details? awesome! my kids would love any of these! Very cool, we could use some new shoes 'round here! Would love to win some for my 2 year old daughter! Cool shoes! Thanks for the chance! What a cool company - would love to win a pair for my daughter. Thanks for the great giveaway! These shoes fit this Seattle momma's style and active life! They are cute shoes. It's hard to find cute boy shoes. I adore the Harmony Pink women's Chooze! You make wonderful shoes!! It was a pleasure to write the review. I am in such need of some comfortable shoes! I'd love to try these. Would love a pair of these! Thanks for the chance to win. Soooooooooooo cute! My girls and little boy would LOVE, LOVE, LOVE these. Thank you for the opportunity!